The project welcomes children from age 3-months-old to 4-year-old. The multi-host Lodeve Childcare Center building has 45 beds for shared accommodation, divided into two units of 22 and 23-beds. 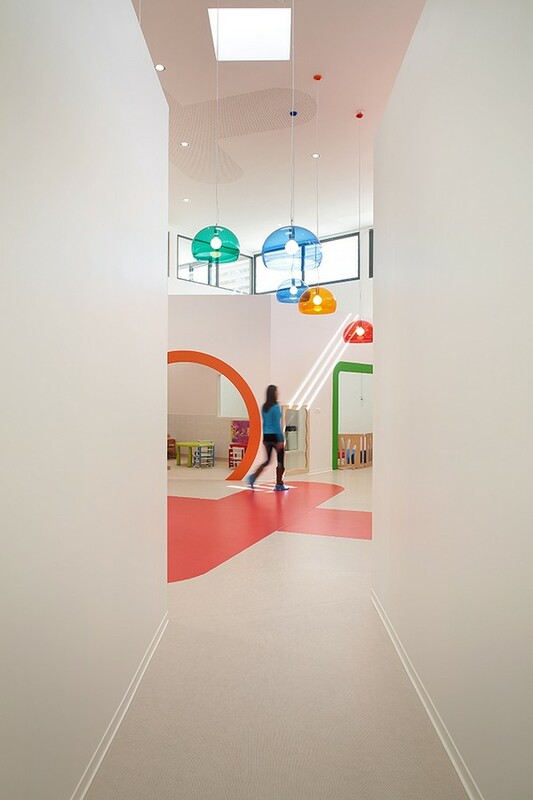 Each accommodates 8 to 9 babies and 14 older kids both permanently and occasionally. 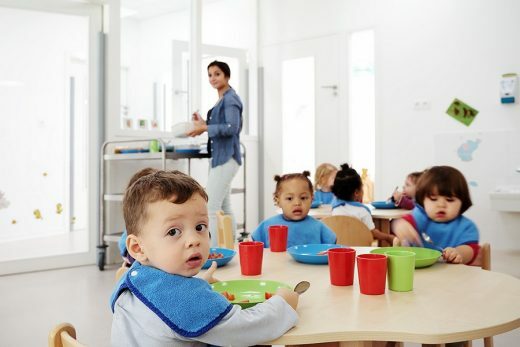 The establishment will eventually receive up to 60 children. 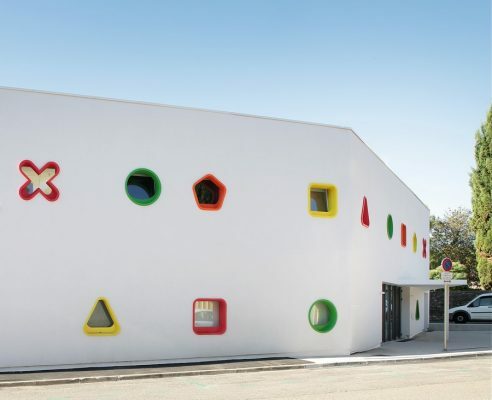 Several entities gather in the building: the 9-bed family daycare, the nursery assistant services, the information and registration hall and the child and youth administrative staff of the Communauté de Communes du Lodévois Larzac. 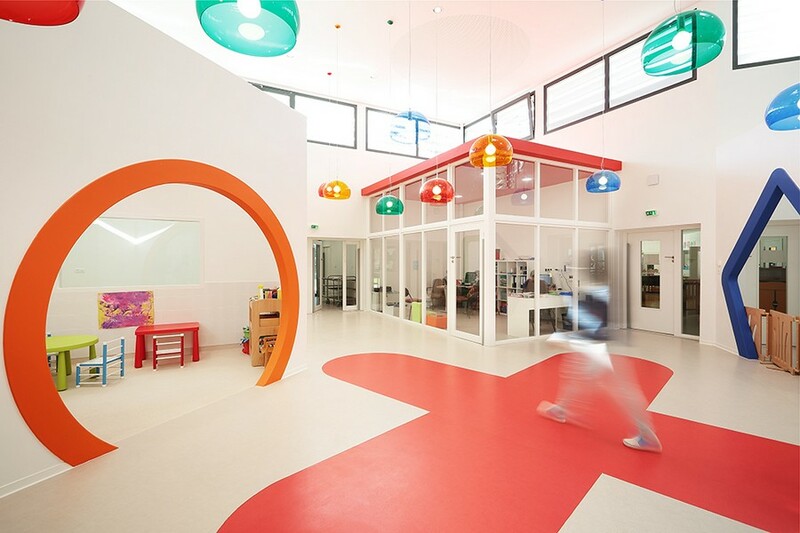 In addition to providing a one-stop-shop resource centre for information and registration, the project is also a wonderful intergenerational place, close to the l’Ecureuil nursing home. The project is located at the angle of two narrow streets in a former agricultural sector. It shares its site with the l’Ecureuil Nursing Home: a rich relationship that adds value to the intergenerational relationship that links the two projects together in the middle of a beautiful garden and of chestnuts. 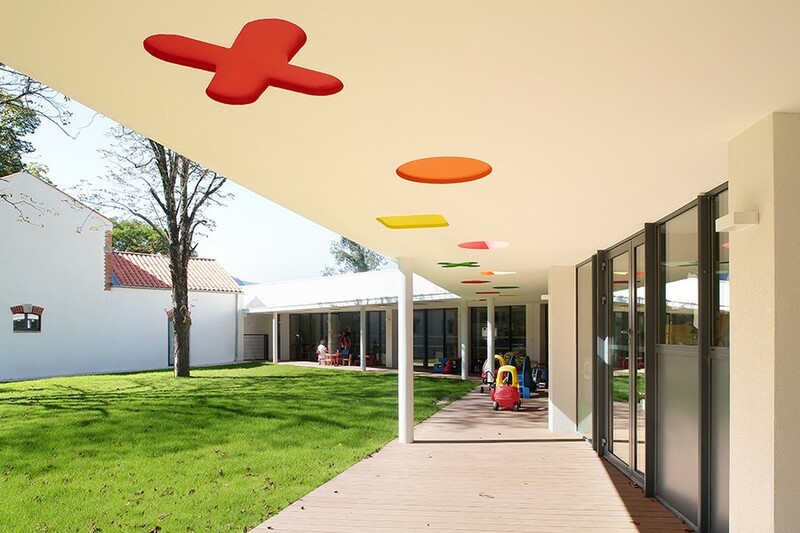 The childcare center is set at the headlands thus allowing the two projects to engage in a rich dialogue facing each other, opening onto the garden and preserving the site as much as possible. 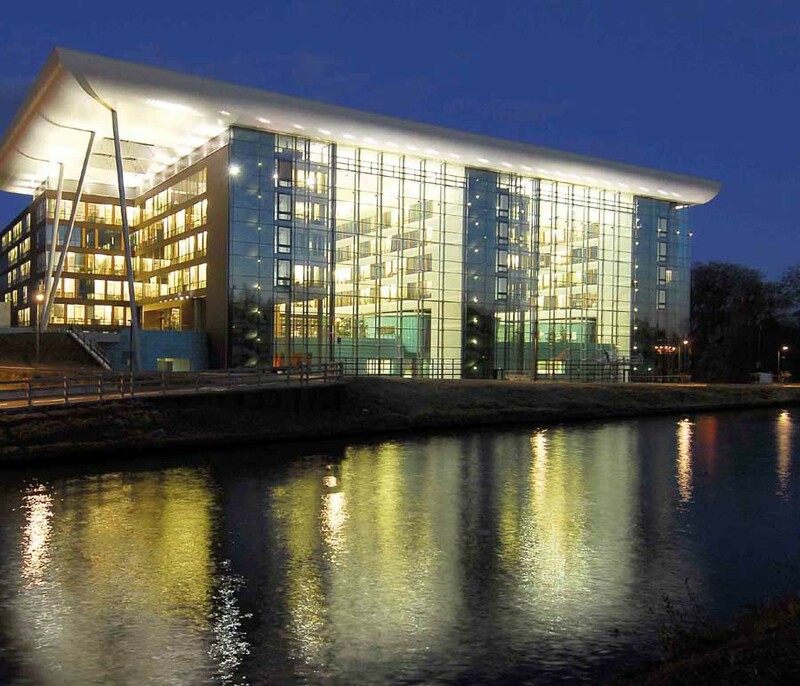 The program requirements drove us to draw a 1-story building harmoniously integrating itself and not breaking the surrounding configuration. 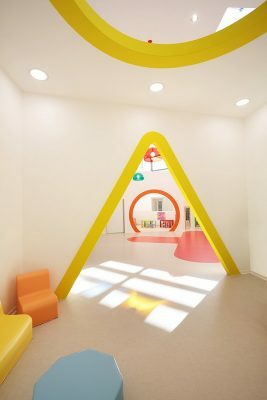 This organization lets the project unfold nicely and logically: on the ground floor we will find all the spaces dedicated to the children, as well as the restaurant. 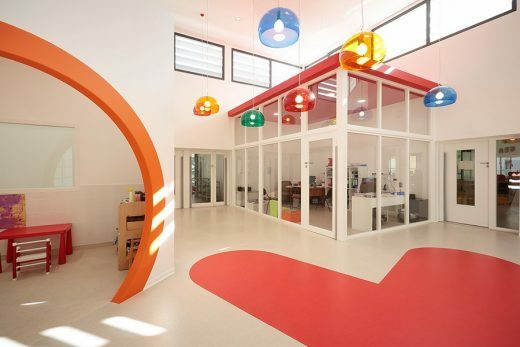 And on the first floor, there are the administrative offices of the Communauté de communes du Lodévois Larzac. 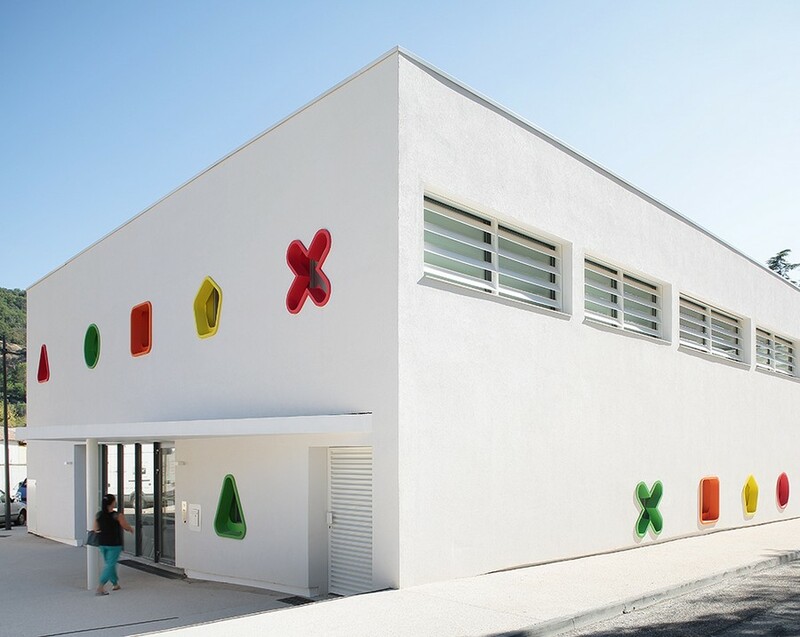 Within the site, we rehabilitated a building transformed into a multipurpose hall for the city. And of course the park, and the nursing home. The relationship between the two projects is based on respect and fun. 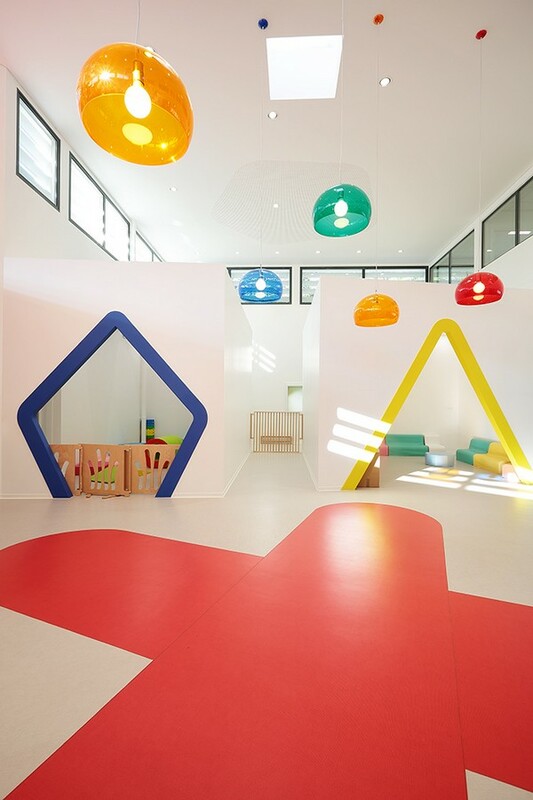 Color strokes echo everywhere and become playful shapes for the children. The open terrace and exterior playground of the childcare centre directly answers to the linear and elegant facade of the nursing home. Each of them, avoiding any partitioning. The mood is set right when arriving on the site: it’s an amusing cocoon for the children to learn and be welcomed in. 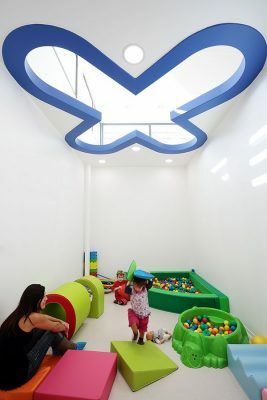 The establishment was conceived to be amusing and to become a tool for the children activity and awareness and a sweet place to work for the administrative staff. The colorful identity of the project brings happiness and allows architecture and more precisely the several spaces to become teaching medium. 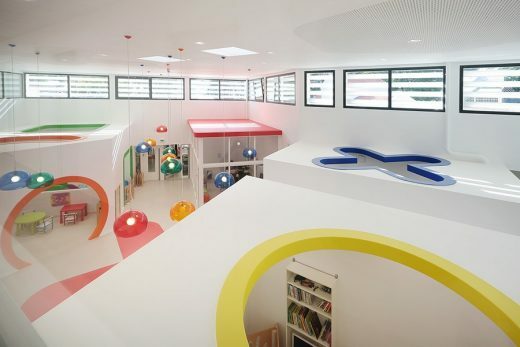 For example with the thematic alcoves bursting in colors and geometric shapes. The whole creates a nice place to live. 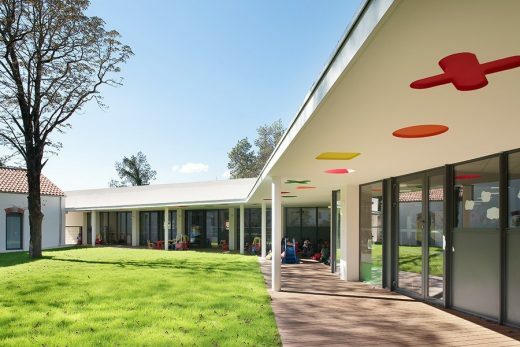 Completed by a large atrium bringing natural light and shadows that play on the walls and the grounds. 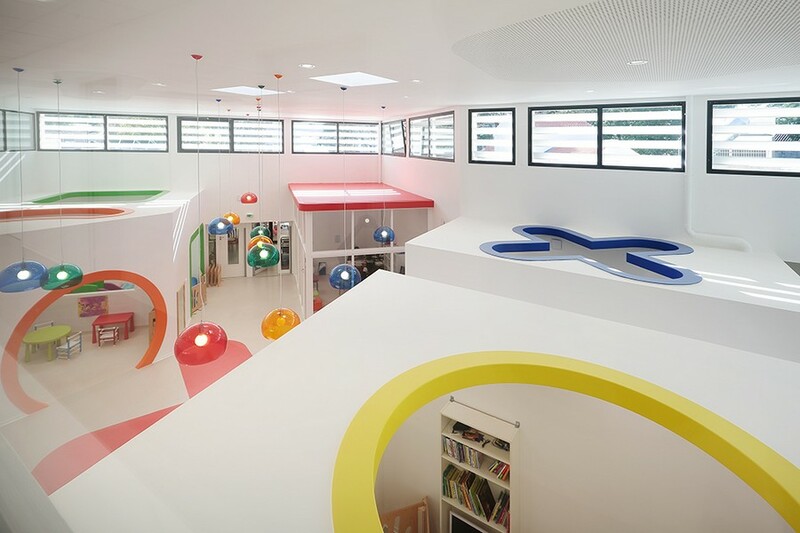 Wide windows let light into the living area, the playground and the restaurant. 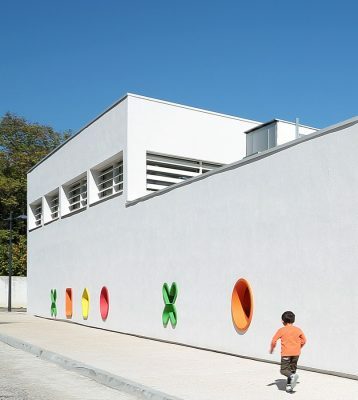 Allowing the children to play safely, to project themselves in the landscape, to widen the view on the park. 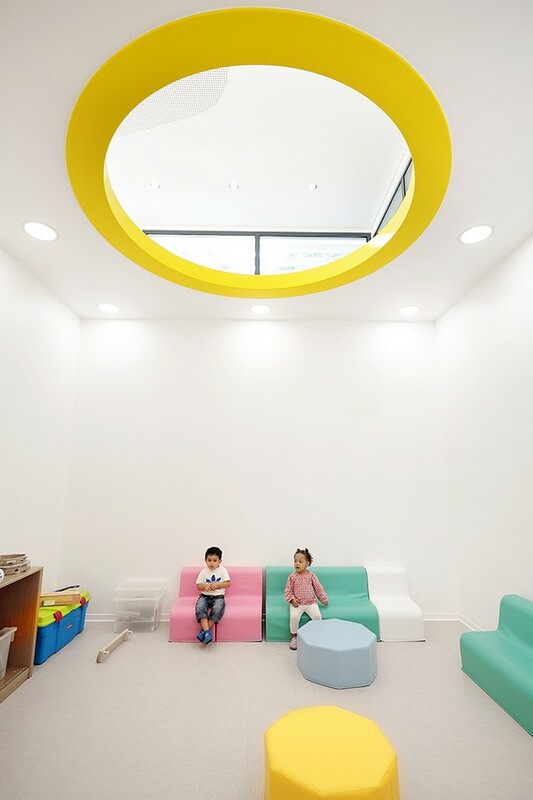 We designed clear and light spaces that communicate with each other. The childcare center is adorned with colors here and there, but in other spaces like the nursery, it is a canvas that the children and staff can appropriate themselves. 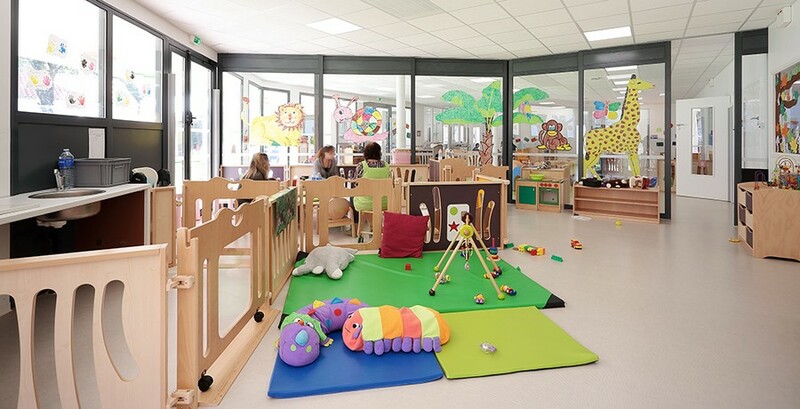 Everywhere the theme of the game is displayed, it offers the children, the childcare assistants and the administrative staff a positive and inspiring environment. 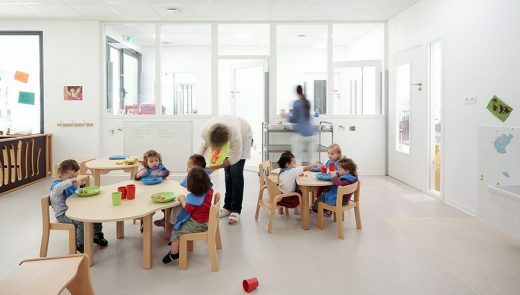 Environmental approach: going to the basics … the kids! 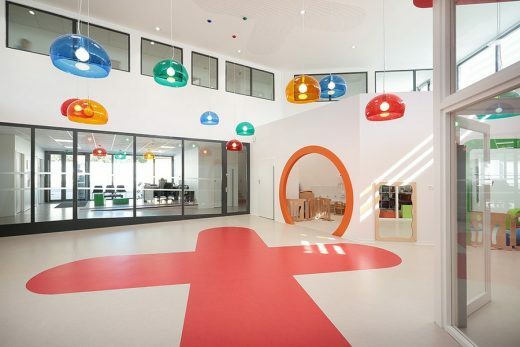 – Harmoniously integrate efficient systems covering the needs mentioned above. building enhanced by a porch making the link with the nursing home. between inside and outside so that once open bays, the boundary between inside and outside disappears. stop phases of the heating network, DHW heating will be generated through solar panels coupled to an electric radiator. Lighting is provided mainly by LEDs or alternatively with low-energy lamps. less than what is recquired by the RT2012. 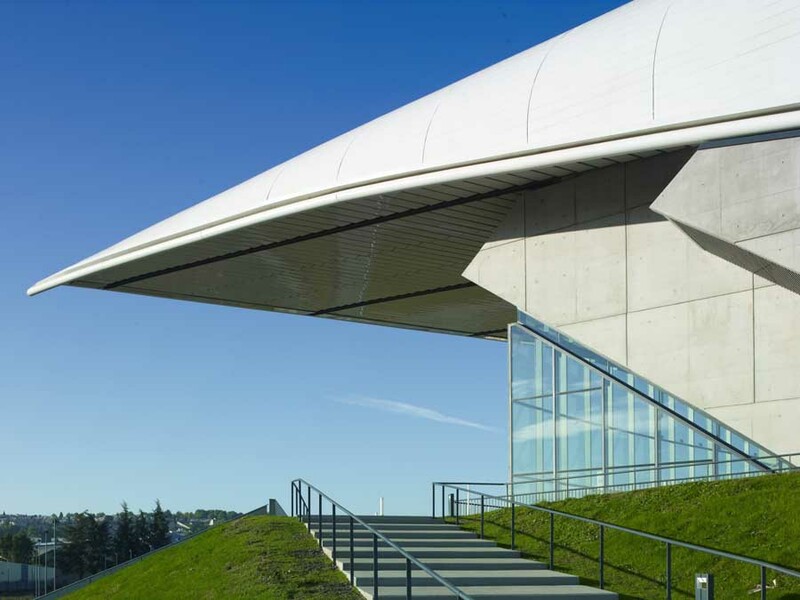 The materials used and volumes mark a new stepping-stone in the history of the city. 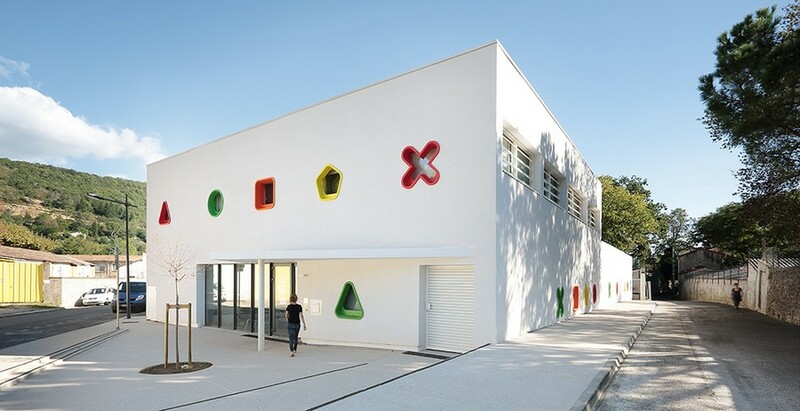 The project asserts its geometric and minimalistic shapes, punctuated with color strokes. We redefined a real human scale between sobriety, efficiency and fun.